Last weekend, when I ordered a chocolate egg cream at Ray's Candy, it inexplicably came in a Wolfgang Puck coffee cup (click to view) instead of the usual Greek-design "We Are Happy to Serve You" cup so emblematic of the city. I thought little of it, figured he got some deal on cheap cups, finished my egg cream, and tossed the cup away. Remarkably, the next day, City Room solved the mystery, telling the story behind the recent proliferation of random coffee cups of New York. Jennifer 8. Lee explains, "much of the eclectic assortment of cups are part of a lively underground market of what are called 'misprints'....they are overruns, discontinued prints, leftovers from promotions, or the results of cup-using vendors who go bankrupt, leaving the manufacturer with unwanted cups." Aside from Wolfgang Puck, the random cups advertise banks, football stadiums, soft drinks, and pharmaceuticals. 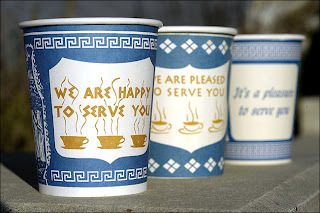 Aside from my feelings about ubiquitous advertising, I am now left to worry that the iconic "We Are Happy to Serve You" cup is about to vanish from the city. I am not alone. Some years ago, an artist named Rodger Stevens had the same concern. As the Times wrote in 2005, "Horrified, Mr. Stevens began assiduously collecting--or, more precisely, not discarding--as many different cups as he could find. Even after realizing that his panic had been premature, he continued adding to his collection. Today he has about 100 cups..."
"These little cups are its distinctive birthmarks. They are all little bits of proof that this is New York and not someplace else." Having them replaced by upscale coffee shop logos (his fear at the time) is "something akin to plastic surgery, an eradication of blemishes that might denote age or a certain, lower status." 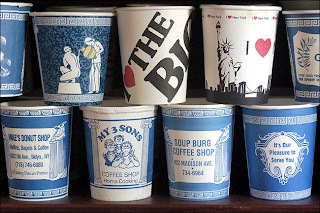 The Times article also tell us, that the cup's "design dates to the mid-1960's, when the Sherri Cup Company of Kensington, Conn., designed it to appeal to the hundreds of Greek coffee shops then operating in the city. The cup was named Anthora, a muddled version of Amphora, the Greek word for the ancient jars depicted in its design." The design changed over time, but stayed identifiable. 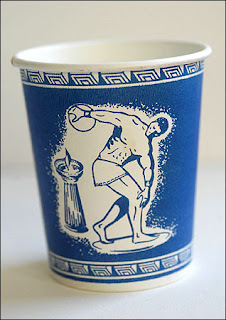 Says the 2005 article, "Greek motifs continue to adorn up to 40 percent of 10-ounce cardboard cups in New York." But that was then. Today, we are besieged by "misprint" cups. In the near future, will the Anthora cup only come in ceramic? Or as coin purses? As Anthora cups disappear from the streets of New York, you can still buy the cup in bulk here. It might be time to stock up. I was at Ray's for a milkshake -- best in the city -- last week and was also surprised by the cup. I remember it had some kind of design or logo, but can't remember exactly what it was. But I missed the blank white cup that I was usually given. It was just very simple and I liked that. this is very timely. just this weekend a friend came into the dog run with a wolfgang puck cup. "ooo, fancy!" someone said. then they explained it was ray's. i think ray's has always had a crazy assortment of leftover cups. i like to think of ray's canibalizing some misbegotten upscale venture instead of just misprints. see? that wolfgang puck cup is giving people the wrong idea. i don't like walking around with cups that advertise things i don't want to help advertise. but i understand the need for cheap cups. maybe someone will go to the link at the bottom of this post and buy some "Greek" cups for Ray. did anyone go to the benefit for Ray last night at Otto's Shrunken Head? Wow, I had no idea. Time to start collecting cups for ebay! Bravo Jeremiah. This is a true New York story. I didn't realize it until you pointed it out. NYC used to have a very strong identity. I sware, NYC's biggest identity is Starbucks. 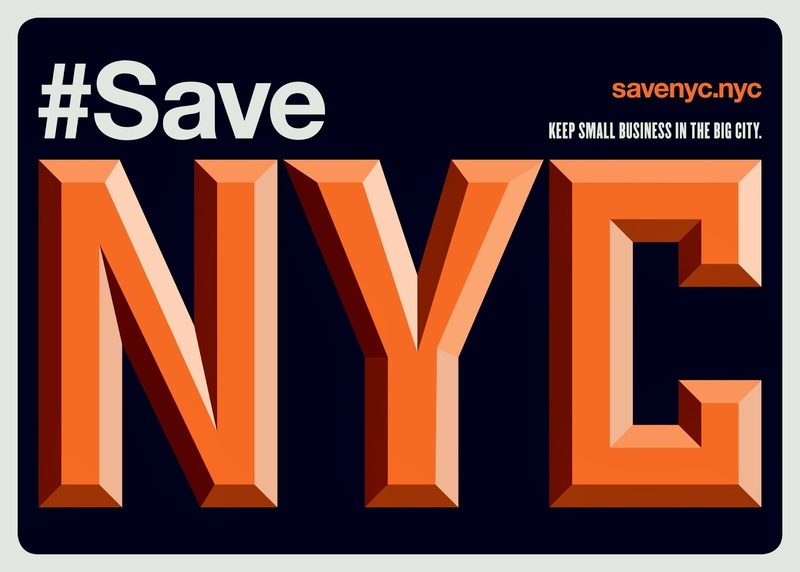 Not the diversity of small businesses like shoe repair shops, coffee shops, corner bars, etc. Now, it's survival of the biggest brand. What really SICKENS ME is that Virgin records closes in Union Square and now they want to replace it with BEST BUY. It's like an urban suburb! Someone PLEASE ANSWER MY QUESTION. Why do you come to New York if they have the same things in your home country or town/city? Thank you so much for reporting on this. I am a native New Yorker and caffeine addict, and for the past three years I have gotten my coffee every weekday at Sing's Deli, at 96th & Park. Initially I believe Sing's used either the Anthora cups or one of the similar designs -- it bothers me that I can't remember exactly. But I do know the design was consistent. Then beginning last year, the cup designs began changing with increasing frequency. Some of them were indeed obvious misprints -- typos. Eventually they changed by the week. I miss the old cups, but as long as they're 10 oz. deli cups with a proper lid (the kind with a flap that folds back, rather than a sipping hole) I can't complain. I'll be going to college this fall, and my coffee will no doubt be completely different. If Sing's vanishes within my lifetime, I will cry. Thanks for sharing this. I love those blue and white cups :( Wondering how I can subscribe to your blog?? Trackback: area code 212, happy to serve you | NYC Rhymology Thanks VNY. Great Article! Thanks a lot - can't help but notice the cup in the credits to NURSE JACKIE. I know this is slightly off point for this thread, but traditionally, the ONLY way to serve a true egg cream would be in a classically shaped Coke glass. It does not taste right in a paper cup regardless of the graphics printed on the outside.